I keep trying to work more fish into our diet, but so many recipes we've tried have turned out to be blah. But we finally found a winner, and it's super fast, healthy, and inexpensive to boot. I picked up some fresh pineapple mango relish at Whole Foods and snagged some tilapia on sale. I seasoned the fish with cajun spice, red pepper and salt and cooked it in a teaspoon of vegetable oil for 2 minutes on each side. 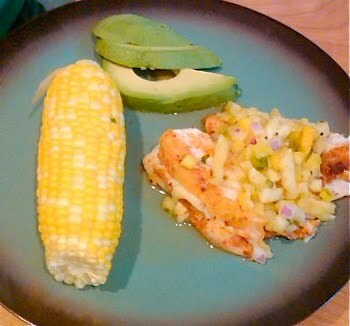 Topped it with the pineapple salsa and paired it with some sliced avocado and corn on the cob. Finally, fish with some flavor, and the whole thing took less than 10 minutes. Wow, definitely a keeper!